There's various different types of party game out there. There's bluffing games like Masquerade and Raise Your Goblets. There's the "vote on a card" types such as Cards Against Humanity and Apples to Apples. Braintopia, coming soon from Asmodee, isn't like any of those. Instead, you and the other players on your team are looking to complete various puzzles as fast as possible. 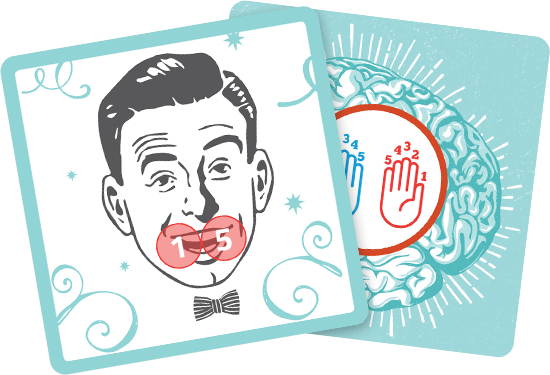 First and foremost, Braintopia is full of small trials and challenges. Every card features some puzzle or activity that requires your careful attention and quick thinking. The puzzles are fairly simple in theory, but in practice and under pressure, you might find yourself tongue-tied at just the wrong moment. Because the cards come and go so rapidly, you will often feel a bit confused. When your last challenge asked you to identify the recurring image of a bear among a throng of other creatures, but the next card requires you to remember its five depicted images, you may find yourself misremembering a simple pair of spectacles as one of the animals you so carefully studied just moments ago. Some of the puzzles themselves can be quite confounding, as well, even without tension of the competition. One that can trip up even the most focused, well-trained player is the color cards. Each one depicts a number of color words, each in a different hue. For example, the word may say green, but the letters of the word are pink. 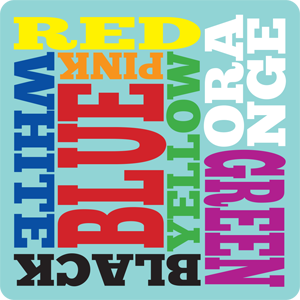 A single word on the card will be printed in the color that the word represents, but your brain may get ahead of itself, recognizing a word on the card and the presence of its color elsewhere.